Turn refrigerated buttermilk biscuits into bakery-style sticky buns with this Sticky Bun Recipe. 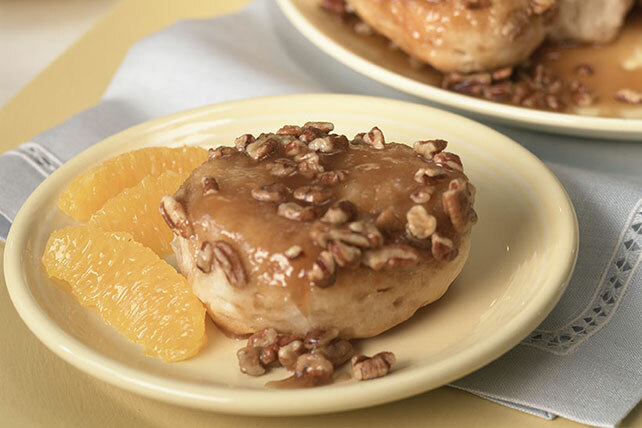 Our Sticky Bun Recipe is a warm, sweet dish for guests. Cook butter, sugar and honey in saucepan on medium heat until butter is melted and mixture is well blended, stirring occasionally. Pour butter mixture into 9-inch round pan; sprinkle with nuts. Arrange biscuits, with sides touching, in single layer over nuts. Bake 16 min. or until golden brown. Immediately invert pan onto plate; remove pan. Spread any remaining sugar mixture from pan over biscuits. Serve warm. Enjoy this tasty treat as part of breakfast on occasion. To safely remove the hot buns from the hot baking pan, invert the serving plate over the top of baking pan. Use pot holders to pick up both the plate and pan, then invert both so plate is right-side up. Carefully remove pan. Stir 1 tsp. ground cinnamon or 1 envelope MAXWELL HOUSE INTERNATIONAL CAFÉ COFFEES Cappuccino into the melted butter mixture in saucepan before pouring into the 9-inch round pan.